Romeo, Last Known Frog Of A Kind, Found A Juliet. Did It Save The Species? Romeo, Last Known Frog Of A Kind, Found Juliet. Did It Save The Species? The once-plentiful frogs had been all but wiped out by a killer fungus, widespread habitat loss and an invasive trout that dines on frog eggs. Researchers had last heard Romeo, a Sehuencas water frog, perform his mating call at the end of 2017. 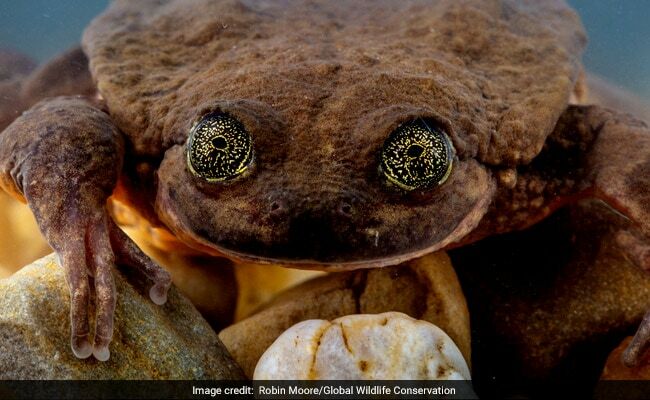 For 10 years, the world's last known Sehuencas water frog, named Romeo, lived alone in captivity in a Bolivian museum. Repeated expeditions by biologists into the nation's cloud forests, the only place the amphibians exist, had turned up no new specimens. The once-plentiful frogs had been all but wiped out by a killer fungus, widespread habitat loss and an invasive trout that dines on frog eggs. Even Romeo seemed to have given up on ever finding a Juliet. Researchers last heard the frog perform his mating call at the end of 2017. But this month, scientists with the Museo de Historia Natural Alcide d'Orbigny and Global Wildlife Conservation announced a discovery that seemed to end this Shakespearean ecological tragedy. Five Sehuencas water frogs - three males and two females - were found at the foot of a small waterfall, offering the possibility that Romeo and his new crew would breed in captivity, and that one day Sehuencas water frogs might be released back into the wild. And so the species has been saved, for now. But the development also raised a complicated question: If Romeo's companions had not been found, at what point would we have declared the Sehuencas water frog extinct? In some ways, this story played out recently with a Hawaiian tree snail species called Achatinella apexfulva. The snails have not been seen in the wild in decades, and on Jan. 2, the last one living in captivity slimed its way across the Rainbow Bridge. His name was George, in honor of the last known Pinta Island tortoise, "Lonesome George," who died in 2012. But George's death does not necessarily mean the snails are extinct, said David Sischo, a wildlife biologist and coordinator of Hawaii's Snail Extinction Prevention Program. Scientists have been looking for them for more than 30 years and are still actively searching, he said. The snails can live only about 20 years, however. "Most known populations of closely related tree snails on the island are rapidly disappearing," Sischo said. "So if there happen to be some out there somewhere hiding, we suspect they will also be gone very soon before anyone is able to find them." Even so, when it comes to something as small as a snail, Sischo said, it's nearly impossible to declare it gone for good. According to the International Union for Conservation of Nature (IUCN), the world authority on species at the brink, an animal can be described as extinct only when "there is no reasonable doubt that the last individual has died." What's more, exhaustive surveys must have been carried out everywhere the species was known to exist, as well as places where it historically existed and might have survived unnoticed until the present day. Official extinction happens with some regularity. Scientists declared a bat known as the Christmas Island pipistrelle extinct in 2017. In 2013, it was the Formosan clouded leopard. The Japanese river otter, the western black rhino and a bird called an Alaotra grebe have also been crossed off the list of the living over the last two decades. But meeting the standard is a tall order and one that is not physically or fiscally possible for every species suspected of being extinct. That is why the IUCN tweaked its categorizations in 2008 to include a "critically endangered (possibly extinct)" designation. A species is given this label when "there is a small chance that they may be [still living] and thus should not be listed as Extinct until adequate surveys have failed to find the species and local or unconfirmed reports have been discounted." Such classifications may seem like semantics, but they have real-world consequences. Not listing a species as extinct could mean wasting resources on a lost cause - resources that could be used to save something else. Likewise, listing a species as extinct before it truly is could discourage last-ditch attempts that might pull it back from the edge. Scientists call this the Romeo Error (a reference to Shakespeare's young lovers and their avoidable demises, not the Bolivian frog). Some conservationists argue that politics are also at play. When organizations present evidence to the U.S. Fish and Wildlife Service that a species is possibly extinct, "it should be like a five-alarm fire," said Tierra Curry, a senior scientist at the Center for Biological Diversity (CBD). "Their job is to prevent extinction, and they should go out and survey for it, and protect it, and figure out if it's there and what it needs." Instead, Curry said, the agency sometimes uses evidence of extinction as "an excuse to delay even looking" for certain species. Take the Florida fairy shrimp. The small crustacean was discovered in a single pond south of Gainesville in 1939 - a pond that has since been obliterated by development. Other nearby bodies of water might serve as habitat for the species, but no one has seen a Florida fairy shrimp in a very long time. In 2010, the CBD and other groups submitted a petition to Fish and Wildlife arguing that the shrimp was very close to extinction, if not already extinct, and deserving of protections under the Endangered Species Act. When the government denied the petition in 2011, it cited the fact that the species might already be gone. "Because the information presented by petitioners and in our files suggests the species is already extinct, it does not meet the definition of an endangered species or a threatened species under the Act," the denial read. A Fish and Wildlife spokesman did not respond to a request for comment, citing the partial government shutdown. However, it's worth noting that the agency has also drawn scrutiny in the past for doing the opposite - investing resources in a species without enough evidence it still exists. In 2005, video emerged purporting to show an ivory-billed woodpecker, a species last seen in 1944, in Arkansas. This was not the first reported sighting, but it was convincing enough to spur Fish and Wildlife to create a recovery plan for the species. In the end, $14 million went into habitat preservation and searches, but no conclusive sign of the bird materialized. H. Resit Akcakaya, chairman of the Red List Standards and Petitions Committee for the IUCN, and his colleagues have been studying the question of when to use the word "extinct" for more than a decade. Recently, they published three studies, called the Extinction Trilogy, in an attempt to standardize how such decisions are made. By assigning scores to certain factors, such as how easy an animal is to observe and identify, how long it's been since it was last seen, threats it faces, and how intensively it has been sought, Akcakaya said he can "calculate the probability that the species is already extinct." The method is still being tested, he said. Even after many fruitless searches, the scientists looking for Sehuencas water frogs were not ready to give up on the species. But in this animal's case, it took a tragicomic stunt to prove they were right to persist. Last Valentine's Day, they created a Match.com dating profile for Romeo. It helped generate $25,000 in donations - money that was used to fund more expeditions to find the elusive critters. "We actually have to get into the water in these streams in the cloud forest and feel around the riverbed, lifting up rocks and looking beneath," said Teresa Camacho Badani, chief of herpetology at the museum and one of the scientists who found the new stash of amphibians. "It's actually sometimes more difficult to see them than it is to feel them with your hands." Now some of the focus will shift toward making baby frogs. "The first option is to test love-at-first-sight," said Camacho Badani. If that doesn't work, she said, the team is prepared to step in with various assisted reproductive technologies. "It's an incredible feeling to know that Romeo has been in our care for over 10 years," says Camacho Badani. "And now he very much has a future, as a species."